Does Earth Day have you thinking about making better choices for the environment? 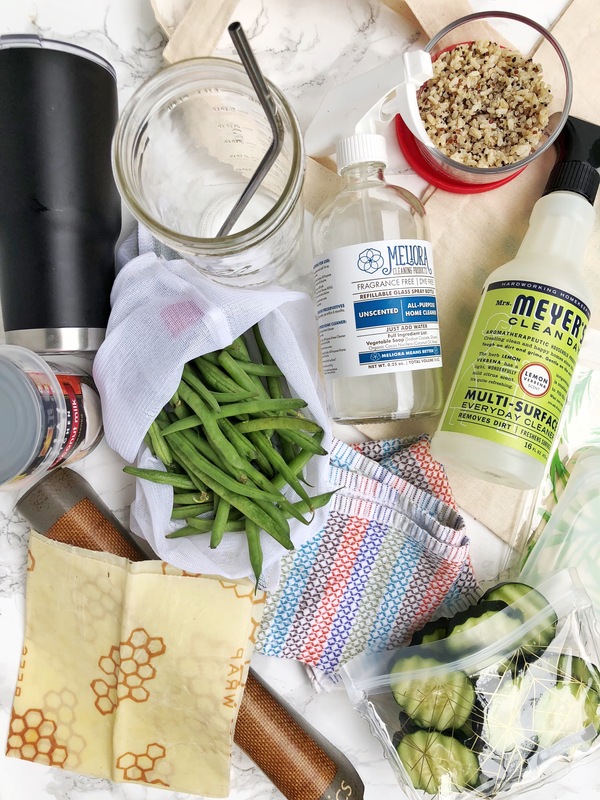 Today I’m sharing My Favorite Sustainable Kitchen Products so you can start taking steps to preserving our precious planet! A large part of my decision to adopt a vegan diet was because of the environmental impact of the meat, dairy, and egg industries. For more information on this, there are a ton of documentaries out there including Food Inc., Food Choices, and many others. (Quick note on documentaries: a lot of the claims are sensationalized and exaggerated. Take the information with a grain of salt and always do your own research.) I also knew that I could start taking small steps in my own life that could add up to a big impact. Support environmentally conscious companies that manufacture products with the earth in mind! Without any further ado, my favorite sustainable kitchen products!! Water filter + reusable water bottle: I have never been a big bottled water consumer, but getting a Brita water filter and reusable water bottle mean we never buy the single use plastic bottles or potentially drink loads of plastic every year. There are non-plastic filter and bottle options, but I use a Brita and plastic bottle because they are light, cheap, and convenient. Reusable coffee mug: Similar to carrying a reusable water bottle, a metal or ceramic coffee mug reduces the number of convenience cups you toss into landfills. I keep mine with me pretty much all the time and take it into coffee shops with me. Don’t feel awkward- baristas are always happy to use your mug! Cloth napkins and dishrags: Although paper napkins are recyclable, they often end up in the trash. So sad! I avoid this problem all together by using cloth napkins instead of paper. When it’s just John and I, we share on Full Circle small dishrag between us and reuse it for a few nights before throwing it in the laundry. My mom got me a cute set of nice cloth napkins for when we have people over. Thanks for keeping me classy, mom. Reusable storage bags: Aside from eliminating paper products, getting rid of plastic baggies was one of the more daunting adjustments I took on. Luckily for me (and you!) there are a ton of amazing products on the market nowadays. You have your pick between silicone, BPA-free plastic, and cloth when purchasing reusable bags. I use silicone for warm foods or things I might reheat, plastic for fruit, veggies, and travel, and cloth for sandwiches or dry snacks. Bees wax wraps: Raise your hand if you always end up spending so much time fighting with the roll of plastic wrap, you just chuck the uncovered bowl in the fridge and forget about it… Oh, just me? 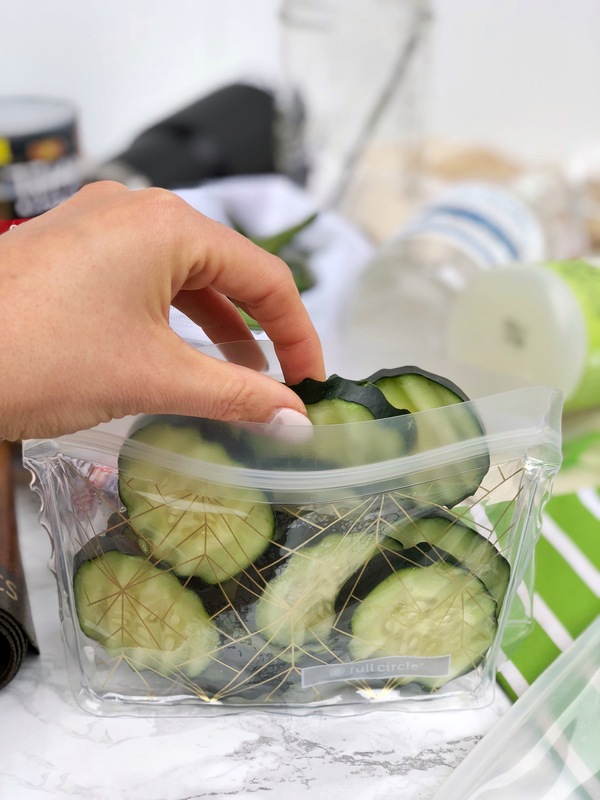 Avoid the struggle and ditch the plastic by using Bees Wraps- cloth coated in wax that acts like a seal over open bowls and containers. The sheets mold with the heat of your hands like magic and last for about a year. So while they’re pricier than the rolls of torture, they’ll save you (and the earth!) in the long run. Silicone baking mats: Do you line your baking sheet with foil or parchment paper every time you cook? That’s a lot of waste! For the most part, you can cook right on your cookie sheet and just give it a quick scrub when you’re done. If you’re using less oil or are worried about sticking, silicone baking sheets liners are perfect! I’ve had mine for years and they still work just like the first day I got them. Metal reusable straws: A few local restaurants announced this Earth Day that they will be eliminating plastic straws. Hurray! Americans use over 500 millions straws a day and most of those end up in the ocean (source) killing wildlife and polluting the waters. There are always a few metal straw rattling around in the bottom of my purse waiting to be plunged into a smoothie or glass of water. Don’t be afraid to say “no straw please” the next time you visit a restaurant! Reusable produce + grocery bags: It seems like every week at the grocery store, more and more shoppers are carting around their own cloth bags. Warms my heart! I’ve bought a few reusable bags, but for the most part ours are a collection of freebies and giveaways that we’ve stock piled over the years. 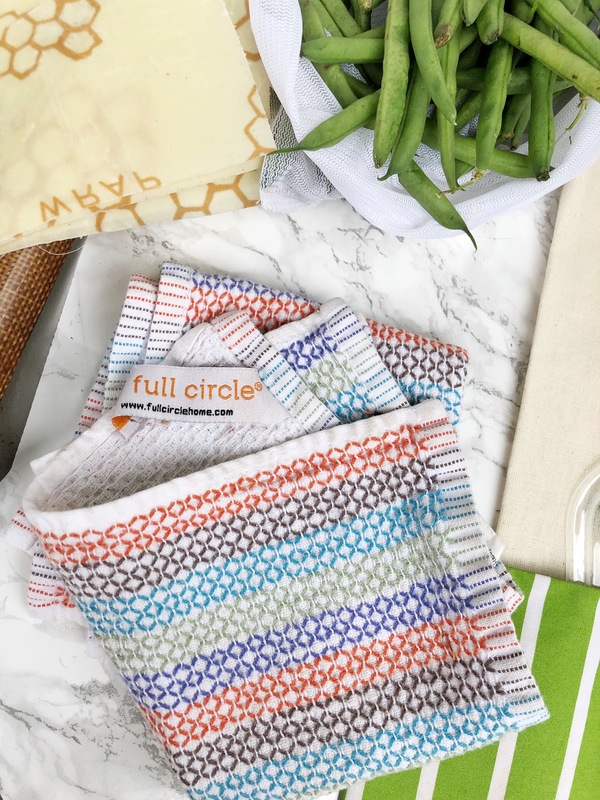 I’ve even used an old spare purse from my trunk when I was in a pinch… We also have a few sets of mesh drawstring produce bags that we use for loose veggies, greens, and fruit. I bet you didn’t even realize you could eliminate those rolls of plastic bags entirely! Silicone storage tops: Full disclosure, John and I refer to these as “can condoms”. They fit perfectly over an open can or jar to keep food fresh in the fridge. What’s great is they they’re super versatile; we use them for cans, bowls, half avocados, half onions, and all kind of other food items. This is one product I never thought I’d need but now couldn’t live without. Compost bucket: When I cook, I’d like to think I’m pretty good about using every part of the plants we buy to cut back on waste. For example, the leaves that come with beets make a great salad and carrot tops make delicious pesto. But inevitably, cooking creates some amount of food waste. Because I don’t want to maintain a compost pile in our tiny urban backyard, I signed up for the Compost Exchange in our city. We pay a small fee to get a bucket that we fill with scraps. Whenever it’s full, we take it to one of a few drop off spots, swap it out for an empty one, and the compost goes to local farmers. Having the bucket has drastically reduced the amount of trash we produce and since there’s no bug-attracting food, we change the bag once or twice a month. Glass storage containers: We used cheap plastic leftover containers for everything when I was a kid. 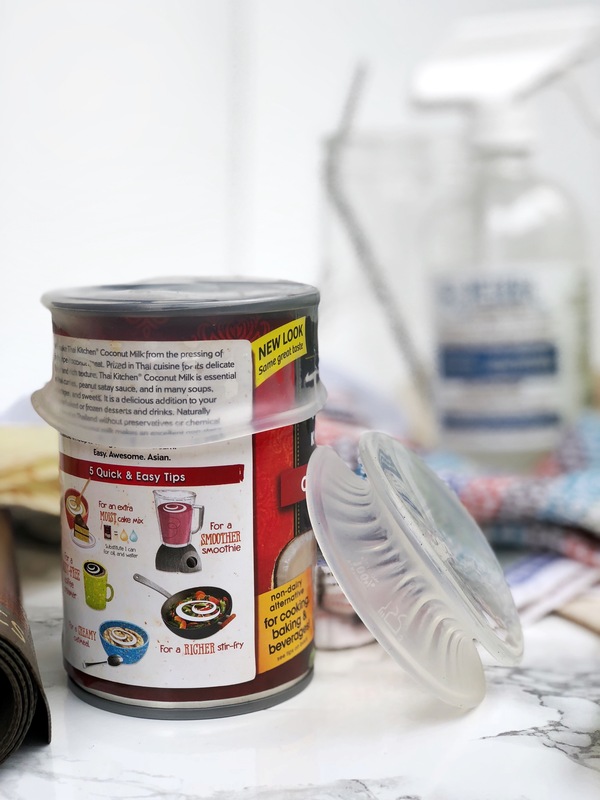 While they’re great for preserving uneaten food, plastic containers can leach chemicals into heated food and eventually break down and have to be replaced. I got a big set of glass containers for Christmas and now we use them for everything! They’re a bit heavier but it’s a small inconvenience compared to the huge impact of eliminating plastic! Glass jars: Similar to our Pyrex containers, glass jars are a go-to for food storage. You may think of dressing, jams, and liquids when is comes to jars, but they can do so much more! Their size make perfect road trip cup holder snack packs- put some hummus in the bottom, carrot sticks or round crackers on top, and get dipping! My favorite are the large wide mouth jars. Every Sunday, I fill five jars with all my smoothie ingredients. Powders, fruits, and greens wait in the jars in the freezer until weekday morning when I dump them in the blender with milk. Then I pour my smoothie right back into the jar and fly out the door! Product Picks: Ball wide mouth mason jars, 24oz., set of 9 ($19.69); tip: save money by soaking the labels off of glass jars you get from store-bought products! 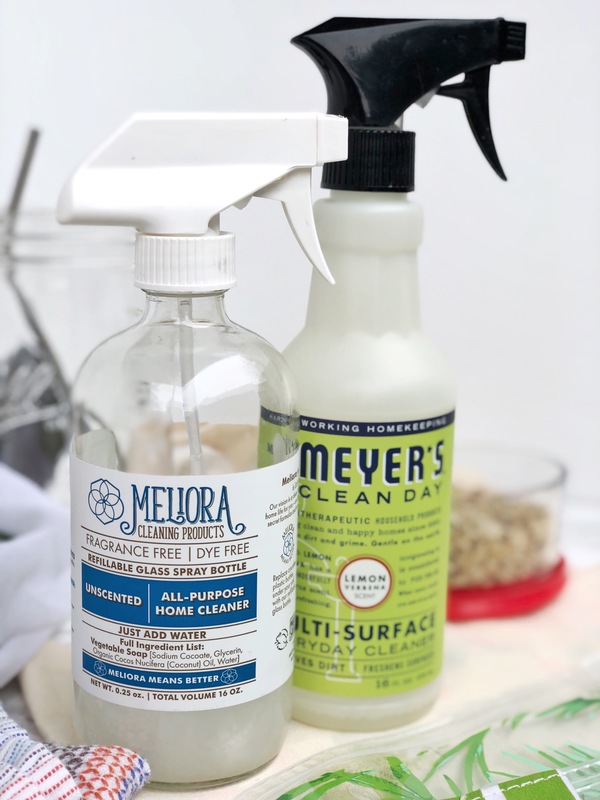 Eco-friendly cleaning products: It’s important to me to buy products from companies that care about the environment, their consumers, and their employees. This applies to all things I buy, but is especially important when cleaning the kitchen. If I’m going to be rolling out cookie dough on my countertops, I sure don’t want a bunch of toxic chemicals coating the surface. If you’re extra frugal, a mixture of water, vinegar, and essential oils makes a great cleaning solution. Looking for more? Here are some additional resources! Mighty Nest/ Mighty Fix: I started down my road to a sustainable home by signing up for a Mighty Fix. For $10 a month, they send you one surprise green product. It’s where I got a lot of the items on this list and where I buy my favorite sustainable goods. Sign up for your own today! GreenSpot Columbus: Did you know the city of Columbus has an environmental initiative? Their site has tons of local resources and tips for cutting down your footprint. Click to register your house as a certified “green spot”- it’s easy! TreeHugger.com has come great resources for saving the planet. Including this article on going green in the kitchen. 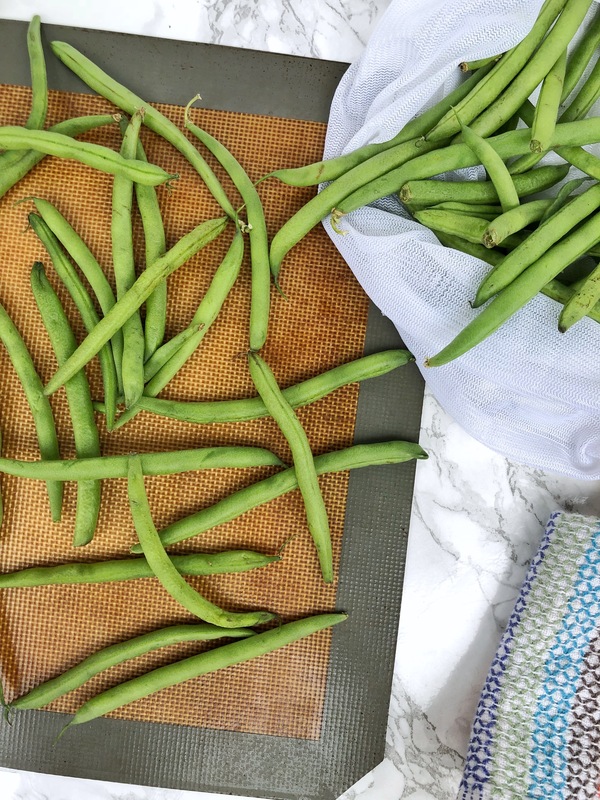 What are some of your ways to reduce waste in the kitchen? Let me know in the comments and we’ll make our earth a cleaner and more healthy place! 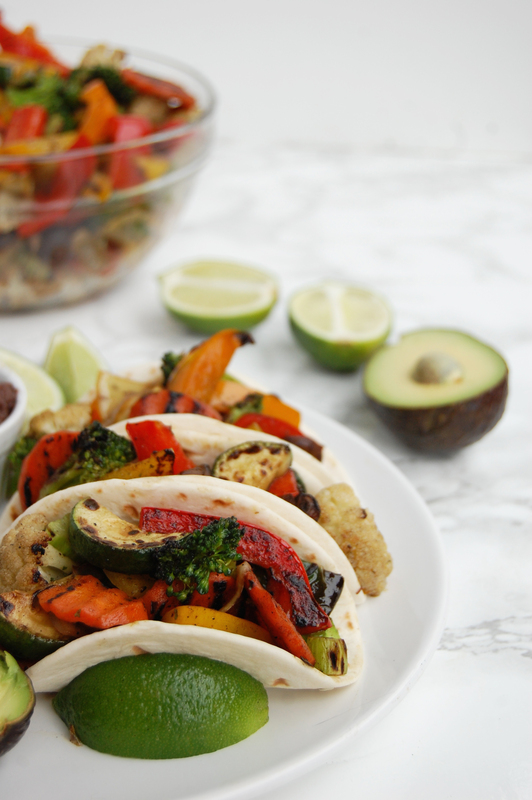 Inspired by the colorful sights and tastes of Mexcio, Loaded Veggie Tacos are an explosion flavor! Ándele, it’s taco time! ¡Hola amigos! In case you haven’t seen or heard my endless rambling about our trip to Mexico, let me fill you in. Two weeks ago, my parents, John, and I set out for Tulum, a small town about 80 miles south of Cancun. We rented a condo for 8 days and enjoyed one of the best vacations of my life. I’m hoping to write a post about it soon, but couldn’t wait to share my new favorite tacos! While we were planning our trip, I was a little worried that vegan options would be hard to come by in Mexico. I was thrilled to learn that Tulum is packed full of eco-resorts, yoga retreats, and just generally a lot of crunchy, healthy people. And while the tourist part offered a wealth of raw kombucha and Buddha bowls, the local fare was just as incredible. And plant-friendly! Of all the places we ate, the authentic spots tucked into the back roads of downtown Tulum (where more locals reside) were my favorite. Being on the coast meant that they all served incredibly fresh seafood, which my family devoured. But the veggie tacos were like nothing I’ve ever had in my life. 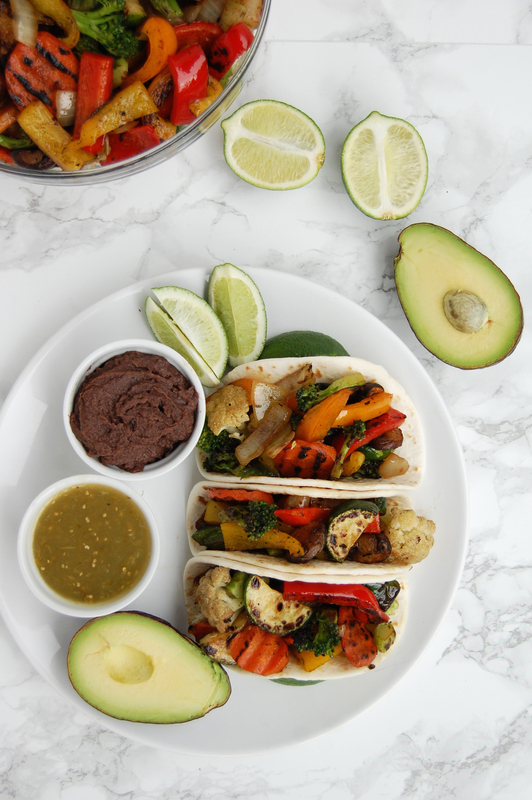 If you’ve ever eaten vegan for a period of time, you’ve probably had some form of veggie tacos or fajitas at an American Mexican restaurant that involved little more than sautéed peppers and onions and mediocre flour tortillas. Tacos in Mexico are a far cry from those steaming plates of sadness. I mean, these things were packed!! 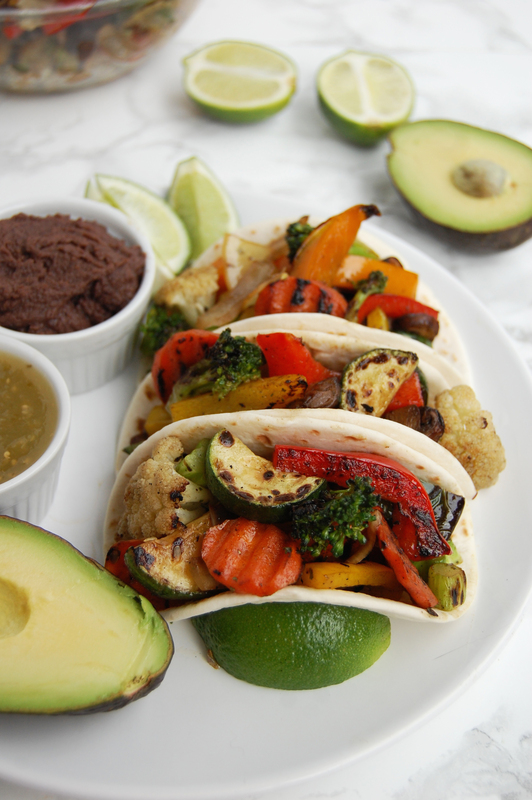 Everywhere we went, I got three or four double-shelled fresh corn tortillas packed to the gills with a variety of veggies. Broccoli, zucchini, carrots, onions, a literal cornucopia of plants. And on the side, beans, guac, rice, plantains, chips, salsa… Whew! I need to unbutton my pants just thinking about it. Clearly, the tacos in Mexico were memorable. I couldn’t get them out of my brain so naturally, I had to recreate them at home. The key to getting lightly charred and perfectly cooked veg is super high heat. I crank my cast iron to 8 out of 10 and make sure to avoid over crowding in the pan. This means cooking in batches but is worth the extra time, I promise. 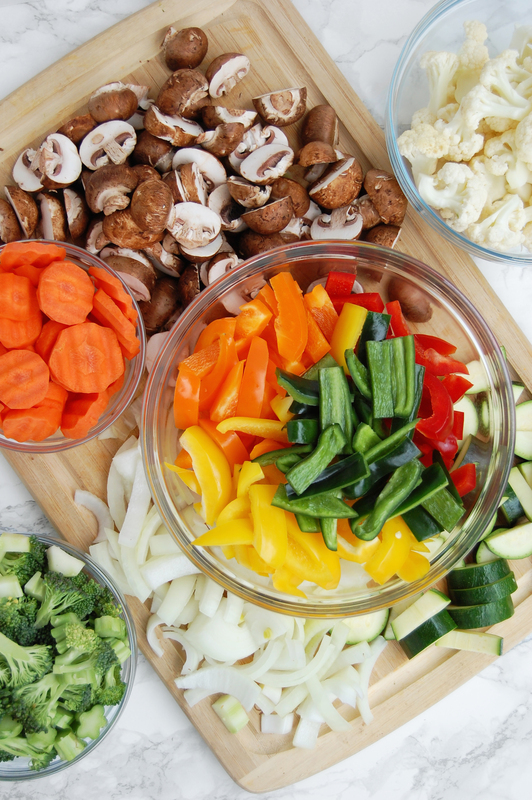 If you prep all of your veggies the day before, you can get everything done in about a half hour. Heat a large cast iron to high heat (8/10) and add a few teaspoons of oil. Cook each vegetable one at a time, until charred and crisp. Once one vegetable is done, remove them to a large bowl. Add more oil between each vegetable and season with salt and pepper at each step. Timelines for vegetables: Peppers: 3-4 minutes. Zucchini: 3-4 minutes. Mushrooms: 4-5 minutes. Onions: 5-6 minutes. Carrots, Broccoli, Cauliflower: 5-6 minutes each (add water and cover to help soften). While vegetables are cooking, gather assembly ingredients. If you would like, lightly char the tortillas on the hot pan or stovetop and warm the beans in a pot or microwave. Once all of the vegetables are cooked, toss them together in the bowl and add the oregano, additional salt to taste, and pepper. If you have a grill, this recipe time can be cut significantly. Cook the peppers, onions, zucchini, and mushrooms whole on the flame and then cut them once they've cooled slightly. I'd recommend still cooking the carrots, broccoli, and cauliflower in a pan with some water. Happy Valentine’s Day! 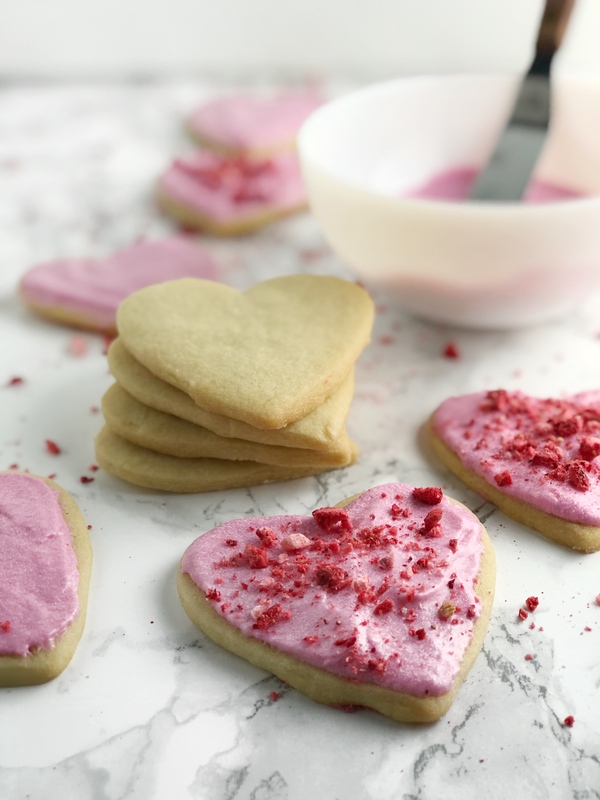 I’m back for my first recipe of 2018 and have been struck by Cupid- I’m in LOVE with Classic Sugar Cookies! I realized I was aiming to start the year with renewed mental strength, just as I had in years past with dieting and disordered eating behavior. Fearing that I was going to fall into an addiction transfer trap and not wanting to set myself up for failure and disappointment, I decided not to push it. 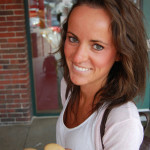 Deliberately and decidedly, I started this year off with no goals for this blog. John and I did set some personal goals like “set boundaries to protect my mental health” and “clean the litter box more frequently” but we worked hard to set objectives that were meaningful and achievable. That said, one “unofficial” goal I have for writing this year is to feature less healthy and green recipes and incorporate more decadent and delightful noms. I still love vegetables and eating wholesome, balanced meals makes me feel great. But you know what fills me with nostalgia and joy? 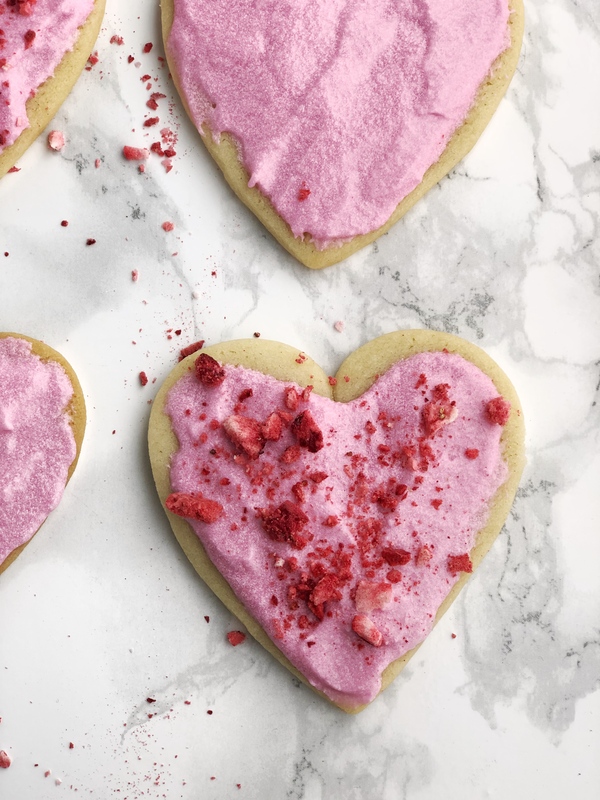 I can take zero credit for the original recipe for these classic sugar cookies. My mom has been baking them every single Christmas for as long as I can remember. 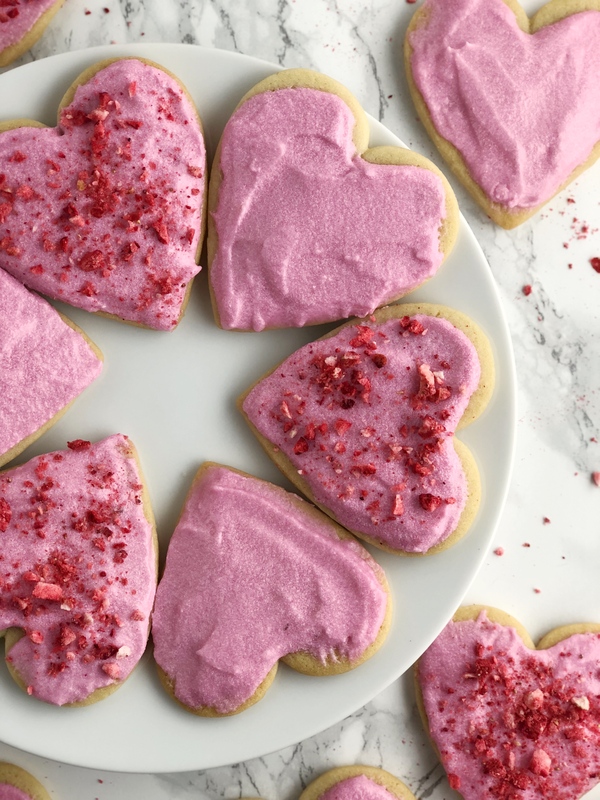 She has a printed recipe titled “Beth Stiver’s Sugar Cookies” (I have no idea who Beth Stivers is but I feel like I owe her a tray of cookies for all of the wonderful memories of my youth) but could probably bake them blindfolded. One week in January, John asked me “Can we have sugar cookies besides just at Christmas?” and I was perplexed. It had genuinely never occurred to me to bake these outside of the holiday season. They were a treat after all, right? But how silly! Why should cookies be limited to one time of year?? So cookies again it was! I’ve experimented with a few variations of veganizing the classic sugar cookies of my childhood and finally landed on a version I’m satisfied with. You’d never know they’re vegan- slightly crispy, soft in the center, and smothered in fluffy buttercream frosting. I may not have concrete plans for writing in 2018, but I do have a lot of plans for eating cookies. Cheers to that. 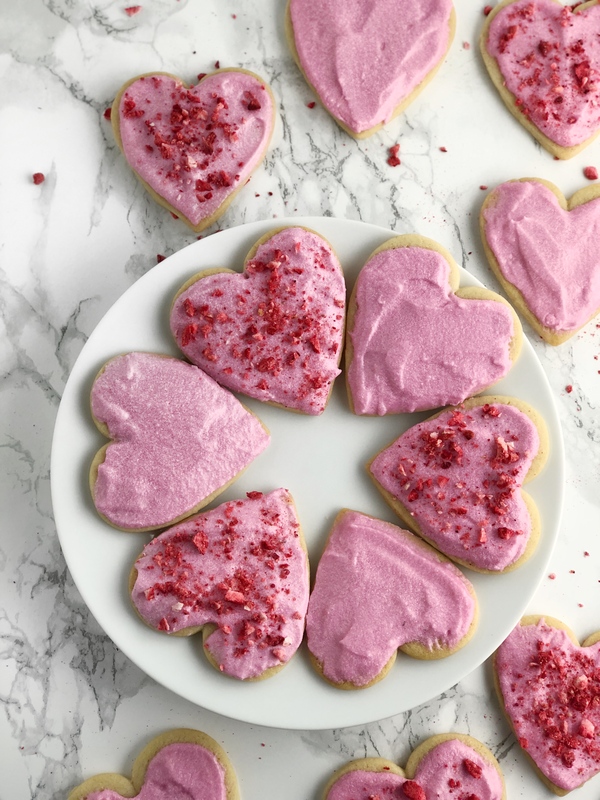 Classic Sugar Cookie cutouts with a light and fluffy buttercream frosting! Perfect for your favorite holiday or, even better, any day of the year! In the bowl of a stand mixer, cream sugar and butter. Add aquafaba and extracts and beat to combine. Sift dry ingredients together in a separate bowl and slowly add into the wet until combined, scraping the sides. Shape the dough into a disk, wrap in plastic wrap, and refrigerate for 2-3 hours, preferably overnight. Heat oven to 375F. Remove the dough from the fridge and allow to soften for about 30-60 minutes on the counter. Divide dough in half, generously flour work surface and rolling pin, and roll 3/16 inches thick. 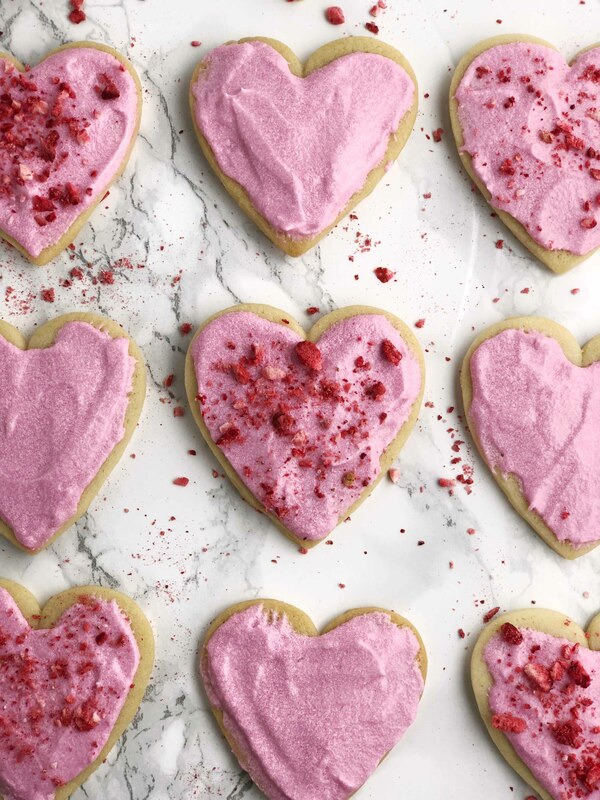 Use a cookie cutter to cut out shapes. 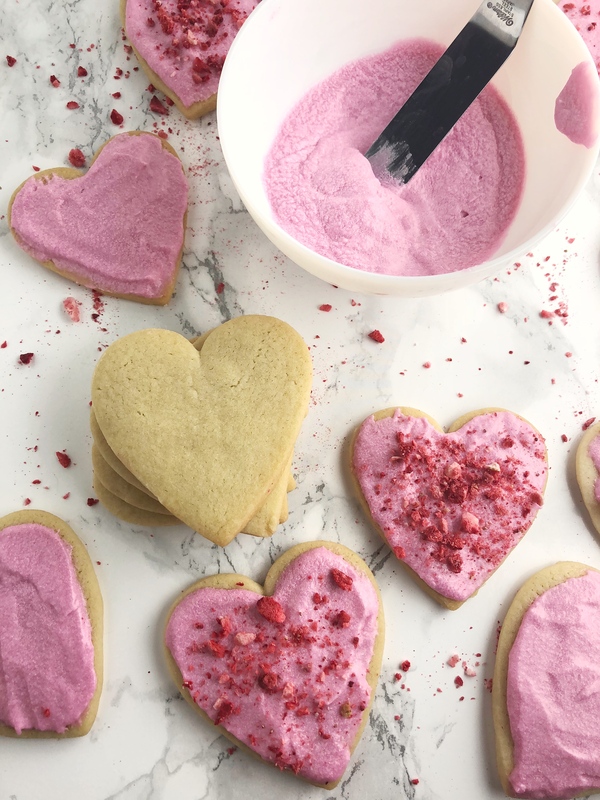 *I like to freeze my cut out cookies for at least 15 minutes at this step to help them keep their shape in the oven but it is totally optional. Bake on a cookie sheet lined with parchment paper for 7-8 minutes or until golden. Remove to a cooling rack and allow to cool completely before frosting. To make the frosting, beat the ingredients together with a hand mixer adding milk a little at a time, until smooth and spreadable. 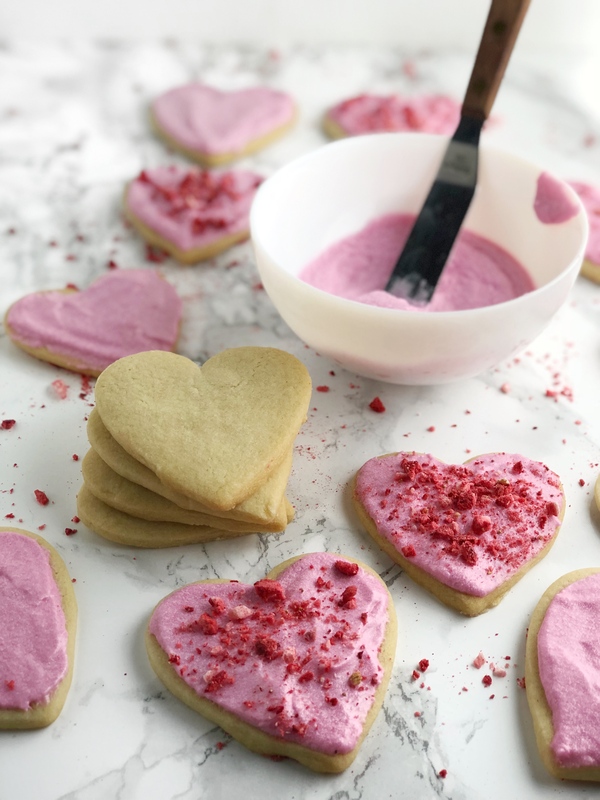 I decorated these cookies with finely crushed freeze-dried strawberries but feel free to use sprinkles or whatever floats your boat!